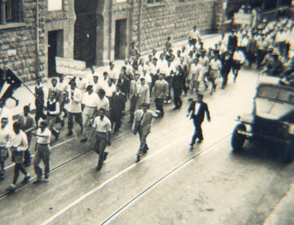 This exhibit focuses on AUB during the period of the Second World War, 1939-1945, using a number of archival material from our collections to provide some insights into the changes, transformations and continuities that the University witnessed during this period. The story we tell is not of the war itself, but of AUB, of its communities, and of the people and events related to them during this period. It starts with the Inter-War years, giving a glimpse onto the changes that the region and the institution witnessed during this intermediary period. It then moves on to tell the story of the University during WWII, a period of defining and lasting regional changes, as many Middle Eastern Nation States were about to be delineated, negotiated and declared. How did AUB position itself vis-a-vis this rapidly and drastically changing reality? How did it respond to the new emerging political and socio-economic regional realities shaped by the war? How did it plan for what it could even then foresee as a new era in the history of the region, with rapid modernization, nascent states, oil power, and national and social movements? Throughout WWII, like WWI, AUB was directly involved in war relief efforts and in social service: through planning, thinking, and implementation, that had started at the end of WWI, an increasing emphasis on the institution's ability to "prepare men" and now women, too, for the challenges of the mid-twentieth century were under way. What we glimpse through the story told here is an institution which is modernizing, adding professional schools, modern ideas about pedagogy, attempts to integrate social and public service into its curriculum, while emphasizing the role of liberal arts education, all in an attempt to form men and women of the modern age, for the modern age, capable of serving their countries and societies. In short, a regional University was in the make, one that will prove to be of great relevance to and impact on the region. At the conclusion of WWII, the Arab world was about to explode with Palestine, with the oil boom and the construction that followed throughout newly formed and independent Arab states-- including a nascent Lebanese state-- all in need of staffing their government and institutions, across the various fields, and AUB was there, ready to provide them with the men and women, with the planning and the professional and intellectual work force needed. The next decades of the 50s, 60s and 70s, until the lead to the Lebanese Civil War, would see an ascendant university, a regional institution, graduating top leaders, politicians, intellectuals, teachers, engineers and architects, professionals, doctors, business men and women, who would go on to change the landscape not only of Lebanon, but of the Arab world. 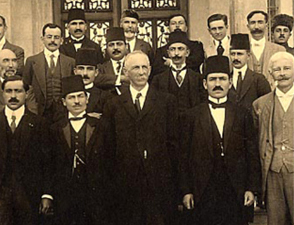 AUB graduates will go on to shape regional realities, as well as playing a key role in producing and reinforcing, as well as participaitng in key ideas and movements, that went on to makr the second half of the twentieth century (Arab nationalism, staffing key governmental positions in many Arab countries, helping chart internaitonal mandates, e.g. Human rights, UN Charter, San Francisco Conference in which more than 20 of its graduates participated.). 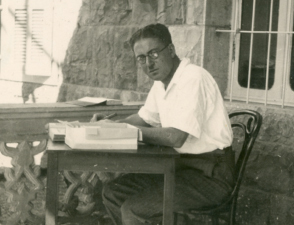 Throughout these turbulent times, AUB always sicceeded in bringing togehter, and nurturing divergent point sof views, and sheltering them all, under the umbrella of a liberal arts instituion and of a top regional academy. Many thanks for research and technical support go to Mervat Kobeissi, Yasmine Younes, Shaden Dada, Sara Jawad and Iman Abdallah. The AUB Gateway on Bliss Street, known nowadays as the Main Gate, has stood on Bliss Street since 1901, as a kind of a local two-faced Janus. For ancient Romans, Janus, the two-faced mythical creature, is the God of beginnings and endings, of transitions and thereby of gates, doors, doorways, and passages; its two faces simultaneously look to the future and to the past. The Main Gate has two facades: one looks outward onto Bliss Street, and the other into the lush campus and community that AUB represents, and hence, it, too, seems to look two ways. The Main Gate is indeed a symbol of transitions, and passages, of beginnings and endings, a Janus-like monument with a dual nature, one that seems to glorify, symbolize, embrace and embody transformations, contradictions and possibilities. 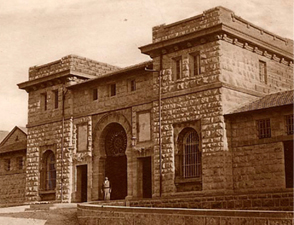 The Main Gate of course defines and marks the main entrance to AUB, but it is many things to many people: it is an entry point into a community; a marking of a privileged space; a dream passage way to strive after and enter through one day; a gate house entrusted with the security of the campus, a symbol of and a doorway onto a greener and richer space, an emblem of the safe haven that the AUB campus affords its community; a point at which to declare one's identity, perhaps by presenting an ID, or for that matter, to leave it behind and blend into a more diverse environment in which past and confined identities are perhaps better left behind. The Main Gate is also a building, not simply a facade, one with a roof, staircase and basement, that is in fact a beautiful work of architecture. It was designed by a world renowned architect, none other than Edward Pearce Casey (1864–1940), the American designer and architect noted for his work in Washington, D.C. and New York City, and responsible for the design and interior decoration of the oldest building of the famous Library of Congress, the Jefferson Building, among other projects. The Main Gate was at first known as the Gate House since it housed the President's Office as well as a reception room for visitors, perhaps indicating the readiness and willingness of the University to engage with its surroundings and its community. For many today, in fact, the Main Gate is indeed a symbol of AUB, one that even stands on a par with College Hall and its Clock Tower, which it was actually meant to mirror, having been deliberately placed at a parallel mid-point facing College Hall. 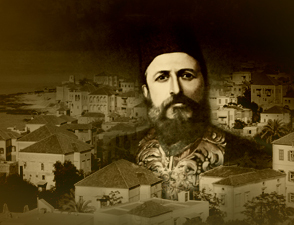 In this exhibit, we propose to look at the history, planning and initial function of the Main Gate building, the architect behind it, the evolution of the building over time, and its impact on and integration into the life of AUB along several axes: security, community, possibility, struggle and hope. Acknowledgments: Many thanks go to Iman Abdallah, Mervat Kobeissi, Dalya Nouh, Hana Sleiman and Sara Jawad for their background research and support. Comics: A Very Serious Matter! Whether one looks at comics as art, as a social critique, as a vibrant modern form of expression, as a means to question and subvert the status-quo, there is no doubt that the history of comics is a history of controversies. Long considered a marginal art, comics have however gained grounds over the past decade: while many comics are humorous and thus do remind us why comics are called comics, comics have indeed become a very serious matter. They are now broadly integrated into academia across Europe and North America, and are gaining following in the academic and scholarly Arab world as well. Conscious of the great potential and ability of comics to capture the "pulse of the time", many academics now consider comics a rich subject of study, one worthy of studying across disciplines, and from a variety of perspectives. Advocates of the ninth art, both within and outside academia, believe that because comics shed light on many questions, concepts, ideas, historical periods, social and economic issues, power relations, etc. across disciplines: comics and classics; comics and politics; comics and literature; comics and history; comics and gender; comics and urbanism; comics and architecture, etc., they are specially fit to support liberal arts curricula. A plethora of subjects and perspectives seems to open up to educators and students alike, in a novel, engaging, contextual and meaningful manner. 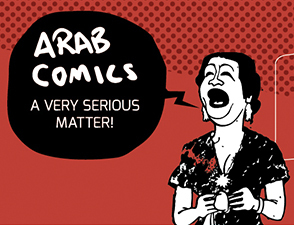 In this exhibit, we focus on some of these questions from the perspective of Arab comics, digging into the wealth of material afforded to us through our growing AUB University Library Comics collection, hoping to open up a realm of discovery onto worlds of comics to be enjoyed and to be taken very seriously! 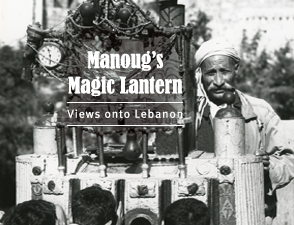 Exhibit Curators: Kaoukab Chebaro and Hana Sleiman. Acknowledgements: Special thanks go to Sara Jawad for her support in design, to Yasmine Younes for her background research, patience and support; to Ghofran Akil for the long hours she put in the design products, and most of all to Lina Ghaibeh for her relentless hard work and unwavering support throughout the planning and realization of the exhibit, and for her contagious enthusiasm for Arab comics!. 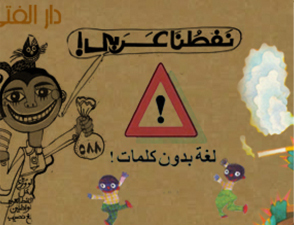 Many thanks go to the Mu'taz and Rada Sawwaf Arabic Comics Initiative for supporting the exhibit and the development of our Library Comics Collection. This exhibition presents a sample of the work of Dar al-Fata al-Arabi, a remarkable and influential publisher of children’s books in the Arab world. Founded in Beirut in 1974, Dar al-Fata, along with its Iraqi counterpart Dar Thaqafat al-Atfal, broke the mold of the traditional Arabic children magazines of the time, which for the most part offered up didactic tales accompanied by lackluster illustrations. Dar al-Fata succeeded in raising the bar immensely by engaging prominent litterateurs to craft original Arabic texts and leading artists to forge a new aesthetic. Authors managed to render scientific, historical, and cultural content in ways that were both accessible and linked with the crucial social and political issues of the time; and illustrators deployed the latest graphical techniques to create images full of whimsy, vibrant colors, and expressive force that drew on deeply resonant cultural and emotional symbols. Progressive politics, a strong rootedness in concerns of social justice and in the Palestinian Question, and the idea of solidarity among the Global South fueled many of the publications. 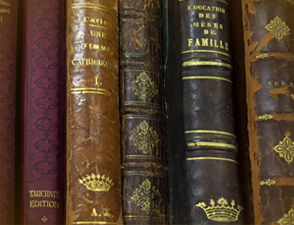 This makes Dar al-Fata’s publications compelling witnesses not only of a highly specialized nascent artistic and educational medium, Arabic children's books, but also of the social and political turmoil, the creativity, and the rich cultural, ideological and theoretical debates and commitments which the region was witnessing. The overall hope and impetus was to address--and at the same time to form-- "al-fata al-Arabi", the Arab child of the future, and thus to make a significant contribution to the development of Arab national movements. The material showcased here gives a glimpse of the rich content Dar al-Fata offers to scholars. Dar al-Fata’s work helps to open windows and to reveal a treasure-trove of material that can inform the study of the visual arts, as well as nationalism, gender, modernity, social and political commitment, and the construction of identity and childhood in the Arab world. The exhibit also highlights the work of one of Dar al-Fata’s leading illustrators, and most prominent Art Director, and visionaries, Mohieddine al-Labbad. Exhibit Curators: Hana Sleiman and Kaoukab Chebaro. Acknowledgments: Many thanks go to Dalya Nouh and Rana Kassas for their support in content development, to Mona Assi, Sara Jawad, Layale Bassil, and Hicham Zahnan for their technical support, and to Mrs. Hasna Mikdashi for providing us with some Dar al-Fata material, and for granting us an interview. Throughout the Bronze Age and well into the Iron Age, Sumerians in southern Mesopotamia made clay tablets “from the sedimentary earth deposited on the banks of the Tigris and the Euphrates”  a Medium of writing in Cuneiform. In addition, papyrus served as writing medium to Egyptians. Papyrus were cut into narrow strips and placed together to form two layers one horizontal and the other vertical. The cells of papyrus fibers were crushed and squeezed under pressure extracting a glue like substance which helped the fibers of the two layers to stick together. Papyrus gradually disappeared and was replaced by Parchment. Then in the 1st century CE, the Chinese invented the art of manufacturing paper from the macerated fibers of vegetal plants, monopolized this manufacturing process, and kept it secret. It was transmitted to the Arabs around the middle of the 8th century CE. The story tells that during the Muslim conquest of Transoxiana, between the 7th and 8th centuries the representative of the Abbasids in Khorasan, Persia commissioned the governor of Samarkand to subdue a Turkic tribe. This tribe had alliance with the Chinese and other tribes, which bring a large segment of the Turkestan region under Chinese hegemony. A fierce battle resulted; the Chinese and their allies were defeated. Chinese papermakers were captured and brought back to Samarkand. The Arabs who then established themselves in southern Spain introduced the art of paper making into Europe. In parallel, several centuries before its use in Europe, the Chinese invented the block printing and the movable type. The latter was not much used by the Chinese, due to the nature of their script. Written evidences have shown that Arabs have known block printing. 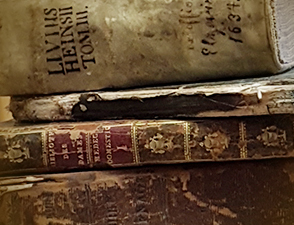 However, the moveable type that will be detailed in this exhibition and the wooden printing press which was modeled after the wine and olive press was invented by Gutenberg. Acknowledgments: With much appreciation to Mrs. Mary Clare Leader for text editing, Mrs. Mona Assi and Ms. Dalal Rahme for technical support, Ms. Basma Chebani for transliteration, Mr. Elie Kahale and the digitization team for digitization, Ms. Sara Jawad for design and Mr. Bassem Fleifel for copyright clearance. Like television, posters engage a wide audience: through a combination of words, slogans and images, they are a powerful tool of communication, reaching out across social strata. Relatively cheap, and mass produced, the poster as a communication medium gained mass prominence and effect during WWI, and served then as a prominent tool of morale lifting, safety warnings, as well as motivating and sustaining efforts at rationing and mobilisation during the War. For a long time, posters were the tool of choice of communication for political parties, the entertainment industry (especially cinema), and also for advertisement. Plastered around cities, on roundabouts, under bridges, on highways, on electrical posts, in narrow alleys across cities, remnants of these long gone messages from the 70s and 80s can still sometimes be guessed or peaked at under chipped layers of paint, or more recent layers of newer posters around various Arab cities. Hard to control or monopolize by the state, posters would keep citizens informed, entertained, or simply chained to the marketing industries. Most ubiquitous were enormous cinema posters, sometimes the size of a two-story building, or political posters with slogans of a political party, images of “the leader”, martyrs, or a timely social or political message. They are remnants and testimonies of bygone gentler eras of mass communication, when the immersive messages of the digital media that we witness nowadays, from the staging on TV of a self-burning in utmost despair and protest, or the cruel mass killings staged by some parties their staging and mediation calculated for maximum fear and control, or the daily bombardments of social media were unthinkable possibilities. What struck us as we were going through the posters collection held at the Archives and Special collections at Jafet Library was the numerous parallels, messages, iconographies and connections that crossed fields and mediums: sometimes the title of a cinema film poster would be echoed in a political one in a verbatim manner, and vice-versa. Sometimes, the gender or political message would be echoed across mediums (political and art poster) or fields (entertainment or political industries). The message would thus become amplified, deepened or enriched across layers of time and fields, across geographic locations, images, symbols, graphics, colors, and methods of printing. 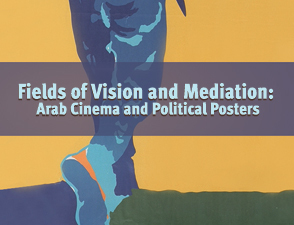 Many of the posters we currently hold in our Library collections were once plastered on the walls of some of the major Arab cities in the 70s, 80s, and 90s, from Damascus to Beirut, to Baghdad and Cairo: they then created a rich dialogue and a discourse across time and geographic locations, one which can be guessed in the small traces they have sometimes left on the walls. In this exhibit, we decided to take these posters out of their drawers, hoping that they would speak to us, fueling a dialogue, a new way of looking and thinking about the Middle East, now that this medium seems to be coming to us from a bygone era, when digital media is the language of the day, and when “unmediated media”, immersive and relentless, seems to be swallowing our everyday. May this step aside, or backward, promise us a gentler mediation, when the pain of others still hurts, and encourages us to do something, to be active agents of change, rather than mere spectators? We invite you to take a look here at a number of these posters, and delve into the worlds of meanings, insinuations, tongue in cheek messages that they embody, propagate and reinforce. They indeed constitute a very apt entry point onto our modern Arab societies’ “fields of vision and mediation”. We hope they can also serve as an entry point into rethinking mediating and representing our region in more accurate, heartfelt and constructive ways than what we have witnessed in the past few years. Acknowledgments: Many thanks go to Shaden Dada, Dalya Nouh and Samar Mikati for their support in background research and content development, and to Sara Jawad for her design and technical support. شهد الشرق العربي حركة ثقافية وإجتماعية دامت من أواخر القرن التاسع عشر حتى الحرب العالمية الأولى. وقد تزامنت هذه النهضة العربية مع أحداث داخلية وخارجية عملت على التأثير المباشر أو غير المباشر على الحياة الفكرية، السياسية والإجتماعية في لبنان وسوريا ومصر. ومن العوامل التي أدت للنهضة حركات الإصلاح الإسلامي، الجمعيات والأحزاب السياسية، وسياسة التتريك التي تقتضي جعل اللغة التركية اللغة الأم، وتهميش اللغة العربية تماماً. بالإضافة لإنخراط الوطن العربي وتأثره بشكل كبير بالفكر الأوروبي. والحملات الفرنسية على مصر وبلاد الشام. 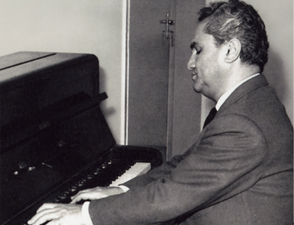 وقيام محمد علي باشا بإصلاحات كثيرة، فنقل من خلالها المعارف الأوروبية إلى مصر، وأدخلها في حلبة المنافسة في مجالات التقدم العلمي والاجتماعي. وكذلك وصول البعثات التبشيرية الى الشرق فأدت إلى تنشيط الحركة التعليمية والثقافية والاستشراق الذي اتضحت أهدافه المخفية للمثقفين العرب فنهضوا يدافعون عن وطنهم ويشكلون عائقا في وجه الإستعمار ويدافعون عن الهوية العربية. وقد كانت بيروت في تلك الفترة آخذة بالتوسع والإزدهار، فأصبحت مركزا تجاريا وصناعيا يقصده الأوروبيون والسوريون، وأهالي جبل لبنان. كما أصبحت مركزا للقنصليات الأجنبية، والإرساليات التبشيرية والتعليمية من فرنسا وأميركا وإنكلترا. 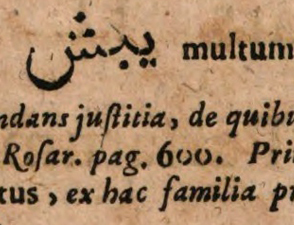 وقد زاد عدد المدارس الأجنبية والوطنية وإزدهرت الصحف الوطنية وتعددت. في هذا الجو النابض بالحياة والحركة والثقافة عاش الشيخ عبد القادر القباني وتفاعل. فكانت للتنشأة العلمية والوطنية التي تلقاها في بيروت، على يد والده مصطفى القباني وثلّة من الوطنيين نذكر منهم الشيخ عبد القادر الخليلي، الشيخ محي الدين اليافي، الشيخ ابراهيم الأحدب، الشيخ يوسف الأسير والمعلم بطرس البستاني، الأثر الأكبر في تكوين شخصيته الإسلامية والوطنية الرائدة. وساهمت هذه الظروف في دفعه لخدمة طائفته من خلال تأسيس جمعية الفنون الإسلامية وإنشاء جريدة ثمرات الفنون وإدارة الأوقاف وتأسيس جمعية المقاصد الخيرية الإسلامية ومن ثم خدمة وطنه من خلال عمله في عضوية ولواء بيروت وإدارة المعارف ورئاسة بلدية بيروت وتوليه مناصب عدة في سلك القضاء. وكان القبّاني رائدا في عدة مجالات تربوية وإجتماعية وإعمارية. وهو "واحد من الآباء المؤسسين للهوية المدنية البيروتية في معانيها الرحبة والوطنية." ففي الحقل التربوي قام بإنشاء المدارس التي حرص ان تربي الناشئة تربية إسلامية منفتحة. وألف الكتب التي كانت المدارس بحاحة ماسة لها. ويعد من أوائل الدعاة لتعليم المرأة، لأنها دعامة المجتمع فكان يؤمن أن لا تقدم للمجتمع دون تقدم وتطور المرأة فساهم بإنشاء أول مدرستين للبنات لجمعية المقاصد الخيرية. وساعد أيضا على تطوير التعليم المهني فساهم بإنشاء مدرسة الصنايع. وقد كان القباني رائدا في الدعوة للعمل الإجتماعي والتضامن الشعبي مع الدولة فحث في جريدة ثمرات الفنون على الإكتتاب لصالح مشاريع إنمائية وإنسانية. وساعد يوم كان رئيسا للمجلس البلدي بتطوير مدينة بيروت من الناحية العمرانية من خلال بناء برج الساعة والسبيل الحميدي وتحسين العمل البلدي وأداء الموظفين وضبط الإنفاق. Acknowledgments: Many thanks go to Dalya Nouh for her support in background research and content development, and to Sara Jawad for her design and technical support.